The Lake County food pantries and soup kitchens are operating at capacity, serving needy families of furloughed Federal employees. With no end in sight to the shutdown of the US government, everyone is pitching in to help, including Lake County Congressman Randy Hultgren. the 80 conservative Republican congressmen who back in August sent a letter to Boehner, demanding that he refuse to pass a spending bill unless ObamaCare is defunded. By some accounts, that letter -- initiated by U.S. Rep. Mark Meadows of North Carolina, and backed by groups such as FreedomWorks and Heritage Action -- is the origin of this government shutdown. So who are the members of this "suicide caucus," as it was dubbed by Charles Krauthammer? You just need to show up and be willing to donate a couple hours of work. 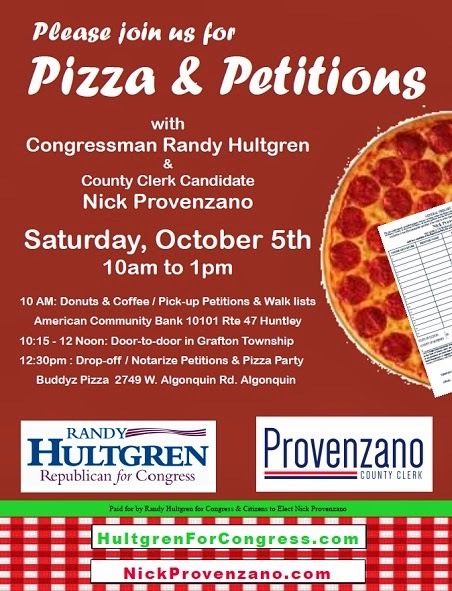 Hungry volunteers will have their choice of either pizza topped with provenzano, or donuts with a cheesy provenzano filling. Ideologue Congressman votes to shut down the Federal government. Furloughed Federal workers go hungry. Furloughed Federal workers are given food to gather ballot signatures for Ideologue Congressman.